Pam Gohn initially studied nursing, but she soon discovered EMS and switched her career’s focus. Pam completed her EMT training in 1994, and enrolled in Paramedic school in 2003. She has also attained certification as a Critical Care Paramedic. In 2005, Pam joined LifeCare Ambulance Service. She is now the Team Leader of the Cassopolis operation for LifeCare. Her coworkers describe her as compassionate, understanding, knowledgeable, and trustworthy. She excels at mentoring other employees. 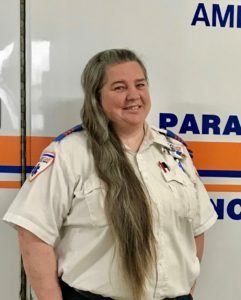 Gohn is a consistent and very competent Paramedic who has compassionately impacted many lives over the course of her 14-year career. Pam’s next goal is to become a licensed EMS Instructor/Coordinator. Pam and her husband, Jim, have been married for 14 years. They share a blended family which now includes four children and five grandchildren! Gohn enjoys spending time with her grandchildren, camping, and home improvement projects. LifeCare Ambulance is proud to honor Pam as a Star of Life.